American Atheists have filed a suit against the World Trade Center Memorial Foundation because the WTCMF is displaying a cross formed from some steel beams left after the building collapsed. The fact that the cross was on display for five years as a symbol of hope to thousands of people makes it an historically significant artefact worthy of display in a museum. That is not good enough for today’s atheists whose hatred for the God in which they disbelieve is so bitter that they cannot countenance any reminder that billions of people know that he is real. As Kenneth Bronstein, New York City Atheists President pointed out: “That a worker resurrected one of these girders and dubbed it a Christian cross is an affront to all of us who believe in our constitutionally based right to have public places free of religious propaganda and religious coercion.” That the cross is an affront to those who are perishing is not exactly a new idea, but that its display is somehow religious coercion defies all the rationality that atheists are so eager to claim as their own. Contemporary atheists will not rest until all expression of Christianity is expunged from our civilisation and its citizens’ lives are rendered as narrow, unimaginative, and vacuously meaningless as theirs. The 20-foot cross — two steel beams that had held together as the building collapsed — was discovered in the rubble of Ground Zero on September 13, 2001, by construction worker Frank Silecchia. The 9/11 cross became a venerated object, and many of those who were searching for survivors and clearing debris from the “pit” took solace from its existence. 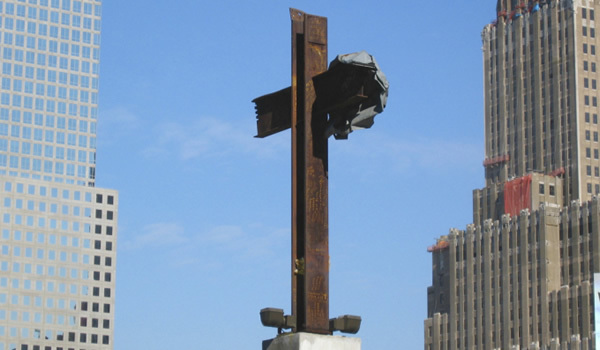 On October 4, 2001, it was moved to a pedestal on Church Street, where it was treated as a shrine by visitors to Ground Zero for the next five years. In October 2006 it was removed to storage, and in July 2011 it was returned to the site for installation in the National September 11 Memorial and Museum. Does Blogging Help or Hinder Online Debate?